The European Space Agency (ESA) launched a fourth European Commission (EC) Copernicus Earth Systems Monitoring project satellite from the Guiana Space Center near Kourou in French Guiana March 7 evening. 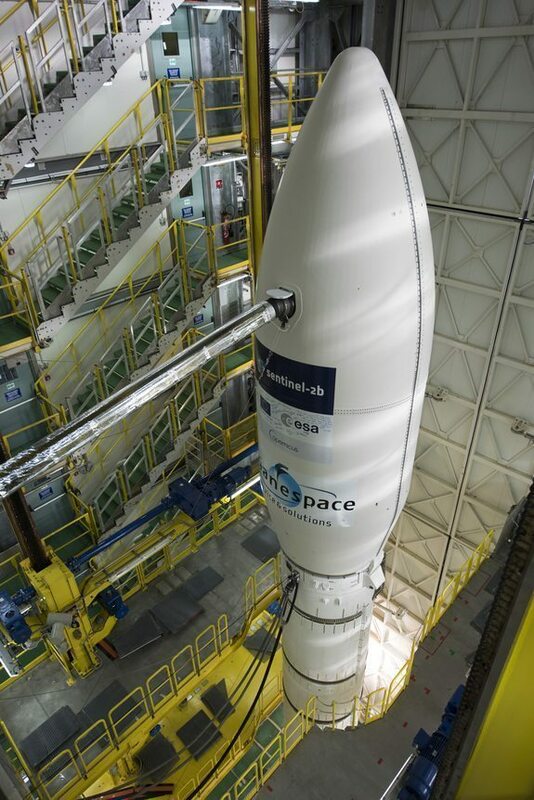 The 1.1 metric ton Sentinel-2B satellite was launched into Earth orbit by a Vega rocket developed jointly by the ESA and the Italian Space Agency and operated by Arianespace. Among its many tasks, the Sentinel satellite constellation will measure and monitor changes in global forest cover and air pollution at a critical juncture in terms of human impacts on the planet’s ecosystems, natural resources and capacity to sustain life. Calibrating and commissioning Sentinel-2B’s instruments is expected to take some three to four months, at which point the satellite will be fully operational, according to an AFP news report. “With this launch, we are taking another step toward advancing the Copernicus program, which is the most sophisticated Earth observation system in the world,” ESA director general Jan Woerner said in a statement. Europe’s ongoing investments in earth science, remote sensing and monitoring from space contrasts sharply with that in the U.S., where President Donald Trump, his administration and leading climate change deniers in Congress are following through on their promises to wipe out federal funding for climate science and global warming research conducted by NASA, the U.S. space agency. 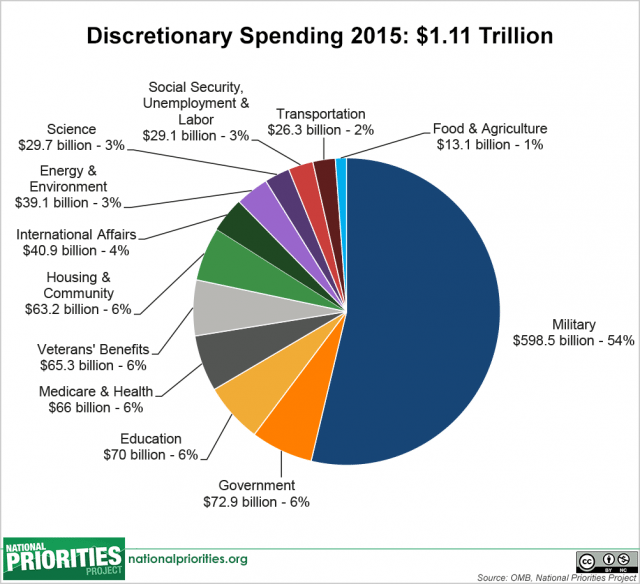 Word from inside sources that Trump’s still formative budget priorities include making deep cuts in federal spending on education, social welfare, and environmental programs in order to help fund even larger proposed increases in spending on the military and national security. The former entails eliminating climate science research and refocusing NASA’s budget on space exploration. With jobs and careers on the line, that reportedly has been received with relief by some and confirmation that the budgetary axe is about to fall on others within the space agency. Last week Trump campaign adviser Bob Walker told the U.K.’s The Guardian that the Trump administration aims to slash NASA’s earth science budget “in the name of cracking down on what the advisor has previously called ‘politically correct environmental monitoring.’” Walker explained that while it may be difficult to curtail current programs, the Trump administration could redirect funding earmarked for NASA earth. science research to other agencies. The “move” is already under way, however. The U.S. Senate recently passed new legislation eliminating NASA’s $2 billion global warming research budget, according to a news report. It’s expected to pass in the Republican-led House of Representatives and garner President Donald Trump’s signature. The chairman of the House Committee on Science, Space and Technology, Rep. Lamar Smith (R-Texas) characterized the NASA budget cut as a “rebalancing,” and emphasized it does not eliminate federal funding for earth science research. 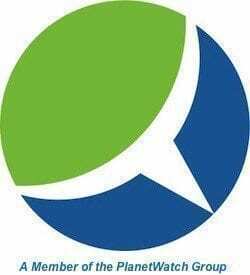 “I’d like for us to remember what our priorities are, and there are another dozen agencies that study earth science and climate change, and they can continue to do that,” he was quoted as saying. NASA’s annual earth and climate science budget increased 63 percent during President Barack Obama’s eight years in office, making it the fastest growing aspect of the space agency’s overall $19-plus billion budget. More federal funds are now being spent on NASA environmental science and research than astrophysics ($781.5 million) and space technology ($826.7 million), the bill’s supporters point out. Remote sensing and monitoring of the Earth from space is the most powerful means and integral tools we have of gathering data and understanding natural processes, environmental conditions and human impacts on them. One that merits more funding given the unprecedented rise in mean global temperatures and sea level, not to mention wholesale ecosystems and natural resource degradation and species extinction, critics argue. Observational data to do with the Earth’s water cycle, e.g. evaporation from the oceans, water vapor in the atmosphere, clouds, precipitation, soil moisture, sea ice, land ice, and snow cover on the land and ice. Aqua is also measuring radiative energy fluxes, such as the amount of infrared radiation from the Earth’s surface; aerosols, vegetation cover on the land, phytoplankton, which form the base of the oceanic food chain and play a critical role as oxygen producers; and dissolved organic matter in the oceans; and air, land, and water temperatures. The continuous sea ice record began with the Scanning Multichannel Microwave Radiometer (SMMR) on the Nimbus-7 satellite (1978-1987) and continued with the Special Sensor Microwave/Imager (SSM/I) and the Special Sensor Microwave Imager Sounder (SSMIS) on Defense Meteorological Satellite Program (DMSP) satellites (1987 to present). 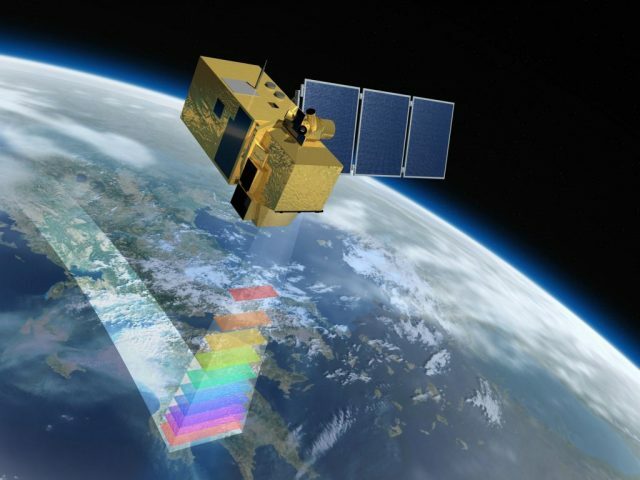 The Advanced Microwave Scanning Radiometer–for EOS (AMSR-E) on NASA’s Aqua satellite also contributed data (2002-2011), a record that was extended with the 2012 launch of the Advanced Microwave Scanning Radiometer 2 (AMSR2) on JAXA’s GCOM-W1 satellite. 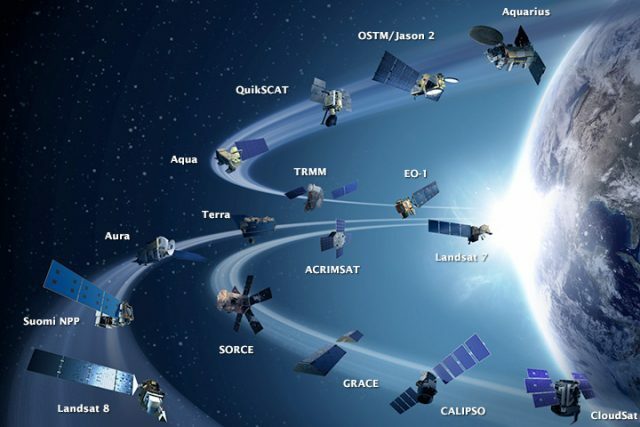 All told, NASA is responsible for 16 Earth-observing satellites currently in orbit. The oldest is the Tropical Rainfall Measuring Mission (TRMM), which was launched in 1997. The youngest, Landsat 8, was launched in February 2013. Collectively, NASA’s EOS satellite fleet monitors a wide range of environmental phenomenon relevant to climate change, weather prediction, fire monitoring, and the health of vegetation, NASA summarizes. “Earth Science is a strong priority of the President’s [Obama’s] fiscal year 2014 budget request for NASA. The budget supports seven new Earth Science missions on course to launch through 2020 after the launch of four new Earth science missions in 2014 – the Global Precipitation Mission (GPM), Orbiting Carbon Observatory-2 (OCO-2), Soil Moisture Active Passive (SMAP), and the Stratospheric Aerosol and Gas Experiment III (SAGE III) instrument to be launched to the International Space Station. For its part, ESA expects to launch two more Copernicus satellites in coming months. Launched in June 2015, Sentinel-SB, a twin of Sentinel-2A, zooms in on changes in the Earth’s land mass and coastal zones, such as forest cover and pollution in lakes and coastal waters. Placed in the same orbit on opposite sides of the planet and sweeping the Earth’s entire surface every five days, the now complete twinned pair of Sentinel-2 satellites will measure and transmit reams of detailed environmental data worldwide. Copernicus project satellites will also provide critical, potentially life-saving information by mapping areas stricken by flood or earthquake. 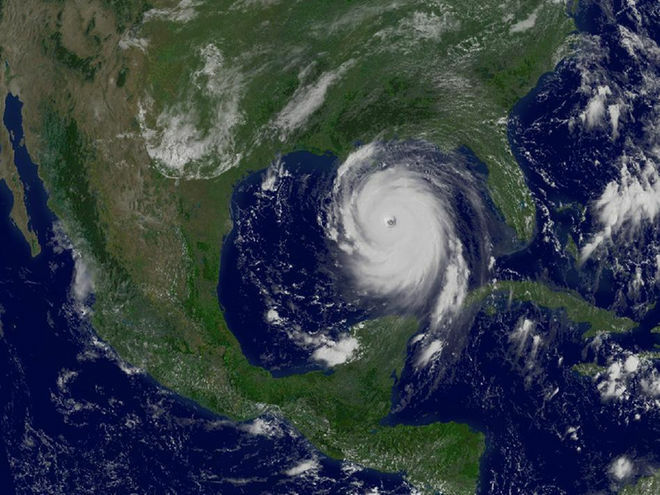 Relevant data from Copernicus satellites will be beamed to disaster and emergency response agencies in order to help response teams teams better and more quickly identify worst-hit areas and locate passable roads, railway lines and bridges.